Espresso makers are not exactly known for their size or portability, and although there are some brands that make fairly small machines, it’s a type of appliance where bigger is usually better. In exchange for giving up a lot of counter top real estate, you get extra power/water pressure and a bigger heating capacity, not to mention faster brewing and recovery times. The Handpresso Espresso Maker set out to prove the good things – even where espresso is concerned – can come in small packages. The hand held gadget needs no electricity and can put out enough for a single serving per use. It uses ESE (easy serve espresso) pods and requires hot water. From there, you pump the handle to manually build up enough pressure to pull a shot. 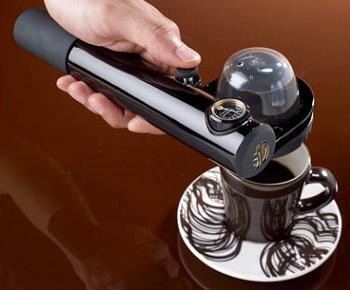 Very convenient and, while it might not be quite up to the standards of a $1,000+ machine, it’s definitely something for a space-pressed coffee fan to consider keeping on hand.